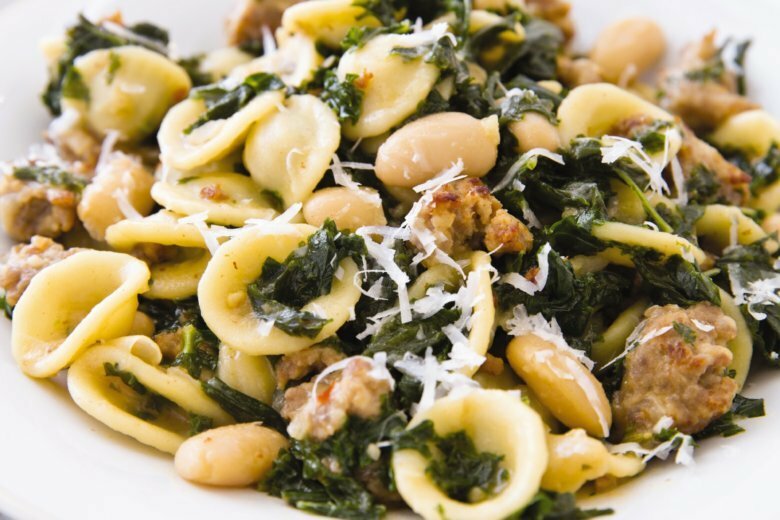 We had our hearts set on a one-pot pasta loaded with tender bites of browned sausage, hearty kale, and creamy cannellini beans. To streamline the recipe, rather than boil the pasta separately or remove the sausage from the pot once it had browned, we built flavor in layers, allowing the addition of each component to form a creamy sauce that tied the dish together. After browning the sausage, we added chopped onion and a can of cannellini beans and cooked them alongside the meat. Some of the beans broke down, creating an effortlessly creamy sauce, and those that held their shape absorbed lots of meaty taste. To boost the sausage’s robust seasoning, we stirred in minced garlic, fennel seeds, oregano, and red pepper flakes, blooming their flavors in the hearty base. When it came to the pasta, orecchiette’s ear-like shape promised to trap the sauce without getting too entwined with the kale. We added the orecchiette along with both water and chicken broth and brought the mixture to a simmer. Incorporating the chopped kale in stages worked best, as adding it all at once caused the pasta to cook unevenly by forming an unwanted insulating barrier around the orecchiette. Plus, the longer-cooked kale blended into the sauce, while the kale added later contributed nice texture. Our finished dish boasted perfectly al dente pasta with plenty of flavor_an ideal weeknight dinner. You can substitute 8 ounces of other pasta shapes for the orecchiette; however, the cup amounts will vary as follows: 2 1/2 cups for ziti, penne, and campanelle; 3 cups for medium shells; and 3 1/4 cups for farfalle. Heat 1 tablespoon oil in Dutch oven over medium-high heat until just smoking. Add sausage and cook, breaking meat into 1/2-inch pieces, until lightly browned, 5 to 7 minutes. Stir in onion and beans and cook until onion is softened, 5 to 7 minutes. Stir in garlic, oregano, fennel seeds, and pepper flakes and cook until fragrant, about 30 seconds. Stir in broth and water, increase heat to high, and bring to boil. Stir in pasta and half of kale. Cover, reduce heat to medium, and simmer vigorously for 4 minutes. Place remaining kale in pot without stirring, cover, and cook until kale is just tender, about 4 minutes. Stir to incorporate kale and simmer, uncovered, stirring occasionally, until most of liquid is absorbed and pasta is tender, 3 to 6 minutes. Off heat, stir in Pecorino and remaining 1 tablespoon oil. Season with salt and pepper to taste; serve, passing extra Pecorino separately. Nutrition information per serving: 644 calories; 229 calories from fat; 25 g fat (8 g saturated; 0 g trans fats); 40 mg cholesterol; 903 mg sodium; 74 g carbohydrate; 10 g fiber; 7 g sugar; 31 g protein.